Considering swim team for your family? Get your feet wet with our hybrid team program. Taking our small group lessons to focus on strengthening technique, adding the commitment of 3-4 days a week of practice during the 4-month season, and throwing in a little friendly competition with inter-squad swim meets. *Swim assessments are required for new incoming swim team members. Returning team members will be assessed during current swim season. Why should I join a swim team? Competitive swimming programs provide many benefits to young athletes including self-discipline, good sportsmanship, and time management skills. Competition allows the swimmer to experience success and to learn how to treat success and failure as two sides of the same coin, while becoming healthy and physically fit. What are the Sunshine Gators? The Sunshine Gators is a 4 month commitment; April – July, August-November, December-March. The cost of the program is $169 per month, per swimmer. The first months fee will be charged at the time of registration, the remaining will be collected monthly, on the first of each month, for the duration of the 4-month program. *If unable to keep the 4 month commitment, a $100.00 drop-fee will be taken the month you leave the program. 30 days advance notice in writing is required when discontinuing the program. Enrollment in the swim team program must be completed in-person or over the phone. New to Sunshine Swim and Fitness Center programs? The first step is to complete the “online registration” form for your swimmer(s); located at the top of the this page. This step is to input your students information into our system, do not “SELECT CLASS” during this process. Once you click “SUBMIT” you are set to arrange a time for a swim assessment by calling the office. All new swimmers will have a swim assessment at Sunshine Swim and Fitness Center. Based on ability swimmers will be put into a small group program (up to 6 swimmers), with other swim team members. Students will be working on mastering the four competitive stroke; Freestyle, Backstroke, Breast stroke, and Butterfly. Has your child participated in programs at Sunshine Swim and Fitness Center in the past, if so, you are already in our system. Call the office or stop by to determine if you will need to schedule an assessment, if your swimmers skill level information is current you may not need to arrange a swim assessment. In which case, you will be able to enroll your swimmer in the team program immediately. Once the swim assessment is completed, and the skill level is determined, you are ready to enroll your swimmer(s) in the swim team program. At the front desk, our office staff will be able to assist you in determining the practice time options. These times may vary a bit from month to month as your swimmer progresses, but the practice time will always be between the hour of 5:00pm and 6:00pm Monday through Thursday. Beginning, Goldfish, Sunfish, Blowfish and Otter Levels practice Monday -Thursday either from 5:00 – 5:25pm or 5:30-5:55pm. At the end of each month swimmers are evaluated and assigned to new small groups based on their progress. Intermediate (Summer Gator Clinic 1) and Advance (Pre-Team Clinic 2) swimmers are assigned to Clinics, this program meets three days a week, each practice is an hour long. Summer Gator Clinic 1: Monday/Wednesday or Tuesday/Thursday from 5:00-5:55pm and on *Fridays from 5:00-5:55pm. By invitation, for advanced swimmers, a *Friday practice from 5:00-5:55pm is also available. During these practices, swimmers will work to become proficient in all fundamental swimming skills, building endurance and eventually work towards stroke and racing techniques. * Friday practices will be held from 6:00pm-6:55pm April through October. Yes, the Sunshine Gators compete monthly in inter-squad competitions. (Tentatively the first Friday night of every month, in place of Friday night practice). The inter-squad meets will be held at the Sunshine Swim Center pool, 9360 Elk Grove Florin Road, Suite 4, Elk Grove, CA 95624. All swim families are asked to volunteer 2 hours of their time to help with the swim meets over the course of the season. Volunteer sign-ups will be emailed two-weeks before the meet date. Tasks such as timing swimmers, managing the ready bench and organizing the awards are needed to be performed by volunteers. This is a crucial part of the team atmosphere it allows the coaches to focus on the swimmers at an important time of their training, while family volunteer’s help with large scale details. Does my child already need to know how to swim? Is there an age requirement? Your swimmer must be 4 years old and must be able to fully submerge themselves into the water, kick 5 yards forward, float on their back for 10 seconds and jump into the pool all without assistance. After the summer, what if my swimmer wants to continue? swimming. EGAC has qualifying times. Swimmers will be tested at the completion of the swim season. Swimmers whose times qualify can join EGAC during their upcoming season enrollment. If your swimmer is not quite ready for the EGAC program, they can re-enroll in the following Sunshine Gator swim season at Sunshine Swim and Fitness Center. 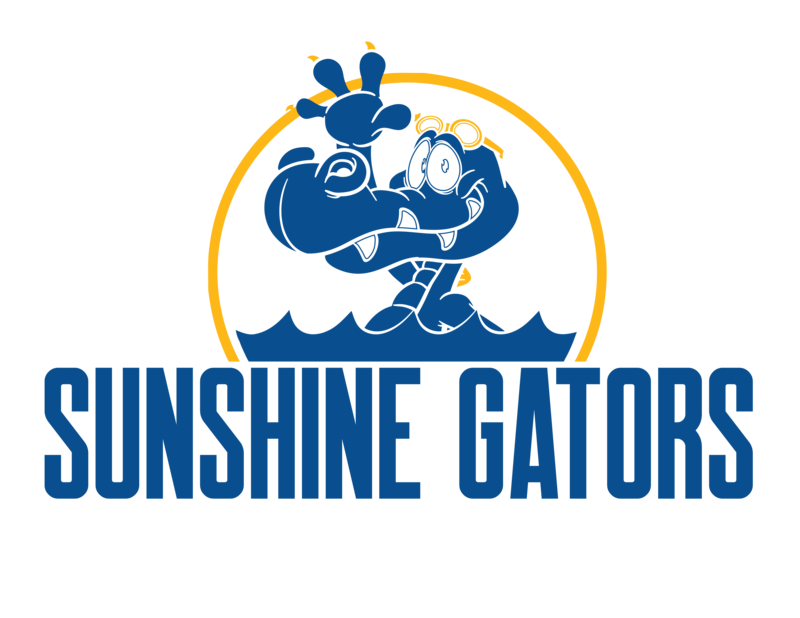 The Sunshine Gators is run in 3 seasons: April-July, August-November, December-March. All swimmers must become members of USA swimming in order to participate USA meets. Elk Grove Aquatics Club has been providing a positive experience for swimmers of all ages for over 20 years. Their team of well-trained coaches work with the Head Coach to help each swimmer reach his or her full potential. EGAC offers a year-round USA competitive swim team program with in the Sierra Nevada Local Swim Committee (LSC) of USA Swimming. This means that each swimmer and family has access to a wide range of resources from both a local team and a national swimming organization. USA Swimming is the national governing body for amateur competitive swimming in the United States from beginners to the Olympic level. We look forward to seeing you on the pool deck! Contact us for more details about joining our swim team.